Politics and racing are always a volatile mix, and that is certainly true with this weekend's Sprint Cup race: the NRA 500 in Texas. That name and the controversy that goes with it threatens to overshadow the actual race itself. Some gun control proponents have gone so far as to argue that the race should not be broadcast on television. This is the first year the National Rifle Association has been the primary sponsor of a Sprint Cup race. In previous years, the event at Fort Worth's Texas Motor Speedway has been sponsored by Radio Shack, DirecTV and Samsung, among others. But the NRA made waves when they announced early last month that they would be the primary sponsor. This is not the first time they have been involved with NASCAR. Last year the organization sponsored a Nationwide Cup race in Atlanta. It's also fitting that it takes place in famously gun-friendly Texas, whose leaders have been trying to woo Connecticut-based firearms manufacturer PTR Industries after that state passed strict gun control laws on the heels of the Sandy Hook Elementary School shooting. But because of the tragedy at Sandy Hook, this isn't any other year. The NRA has faced more criticism than possibly any other time in its history as Congress mulls the possibility of new gun control laws. I have no desire to wade into the gun control debate here, but it's clear that the NRA's sponsorship of the race has made this weekend's NASCAR race far more politically charged than usual. And the responses to it have certainly been interesting. "I write today to urge you to not broadcast NASCAR's NRA 500 at Texas Motor Speedway on April 13th," Murphy wrote. "This race, which is being sponsored by the National Rifle Association (NRA), is going to take place during the Senate's consideration of legislation to reduce gun violence. The race not only brings national attention to an organization that has been the face of one side of this heated debate, it also features the live shooting of guns at the end of the race." Keep in mind that those pistols being fired at the end of the race are loaded with blanks. NASCAR has received the brunt of the criticism, but it's important to remember here that sponsorship deals are made between the track and the sponsor, although NASCAR has the right to veto them if they see fit. Eddie Gossage, the president of the Texas Motor Speedway, told CBS Sports he actually hasn't heard much in the way of controversy over the race. He said the NRA's sponsorship is "not about politics. It's about sports marketing." Gossage has said that the deal for NRA sponsorship took place well before the Sandy Hook shooting, but that the announcement of it came after. He also said he doesn't expect any kind of drop in attendance for the race. "If we win the race, we're going to treat Victory Lane just like any other race, and we'll be happy to celebrate just like everybody else has celebrated here in the past." That celebration involves cowboy hats and pistols that shoot blanks. "I own guns," Earnhardt said. "I like to hunt. When I'm not hunting, I keep my guns in a safe place, out of reach from my younger family members and my nieces and nephews. I like to hunt and I believe in ownership, but I also believe in responsibility. You can't ever be safe enough in regards to that, especially with gun ownership." 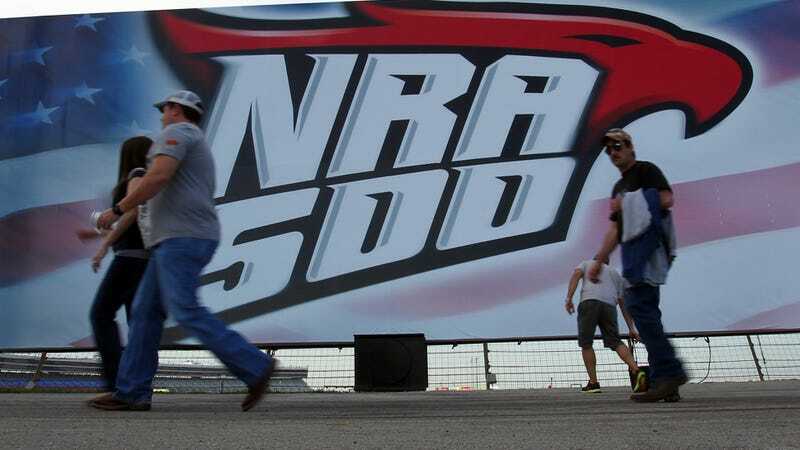 "The NRA's sponsorship of the event at Texas Motor Speedway fit within existing parameters that NASCAR affords tracks in securing partnerships," Higdon said. "However, this situation has made it clear that we need to take a closer look at our approval process moving forward, as current circumstances need to be factored in when making decisions." While the NRA's sponsorship of the race may receive negative media attention, I don't really see it hurting NASCAR's pocketbooks or its image in the eyes of its fans. Don’t expect Nascar or its drivers to immediately forsake the NRA and its financial support. These are tough times for auto racing and major sponsors are difficult to find. Besides, the Sprint Cup roster of drivers includes many hunting and shooting-sports enthusiasts. They may not be willing to turn against a group they may have long considered an ally. I think it's a shame whenever politics detracts from motorsport, so it's kind of sad to see this controversy — one that Americans will probably never settle — overshadow this weekend's race.